When and why you should add your survey into your website? Want to gather information from your website visitors? 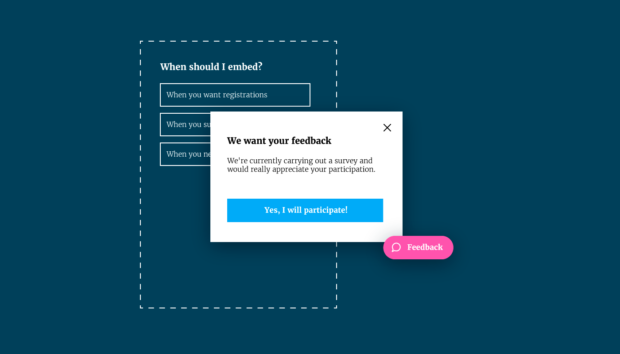 Embed your surveys, forms, and quizzes on your website and collect data from the right people. Email distribution remains the most popular way to attract respondents since you can invite the exact audience whose input you desire and track their participation. However, we must not overlook the advantages other survey distribution methods have, for example, embedding. With Enalyzer, you don’t need to be a website developer. Simply add a tag to your website’s HTML and you’re good to go. This could be anything from event registration, to newsletter subscription, to job applications. If you have a detailed post about an upcoming event or are look to hire new people, you’ll see more and better results if they can register right then and there, instead of being redirected elsewhere. We recommend a standard embed. Make it easy for customers to contact you directly in every single platform, for example, people can now message you directly on Facebook. But why is it that the majority of companies think it’s enough to just list their phone number/email? Whether it’s a contact or a feedback form, we advise that you make it visible and accessible by adding a button on the corner of your website. Click on ‘button’ and design it to fit your brand. The button will be on the bottom right corner of your website. The best place to gather thoughts and comments about your website and blog is at the scene of the crime (was that too gory?). This could be collecting feedback on recently redesigned pages, purchase experience, overall impressions. For this, we recommend pop-up surveys. Click on ‘pop-up’, insert the text, design it to fit your brand, and define the second delay. → Create a FREE account and start adding your survey to your website!